Last Wednesday, members of the crew of the Enterprise had a rare opportunity – to eat turkey one day, and watch one play keyboards the day before. So, without the use of transporters, a landing party comprised of Captain Dave, Commander Mitch, Ensign Brittany, Ensign Ellen, Ensign June and myself made our way to Hastings on the Hudson for dinner followed by a live performance of Lieutenant Jonathan and his band, CC & Company, at the River Roadhouse. The evening started with dinner at Tony's, a local steak and seafood joint, featuring an array of great meals. Always thinking about sailing performance first in an attempt to add more weight to the rail on windy days, June and Ellen ordered the Seafood Paella, a dish full of lobster, shrimp, mussels, clams, scallops and rice which came in a pot big enough to park a small SUV. Jonathan did join us for dinner, but did have to leave early to go set up with the band. Apparently CC & Company hasn't reached a level yet to obtain roadies. But, Jonathan did stay long enough to explain his Greatest American Hero costume from Halloween, which apparently included wearing his wife's red leotard. I guess it goes well with the green purse he brought for the charity cup. Still, we all commented on the uncanny resemblance between our Lieutenant and William Katt’s Ralph Hinkly (or Hanley, depending the season) – Believe it or not . . . The River Roadhouse was a small place, filled with 40- and 50-somethings singles that rivaled looks-wise to the bar-goers in the original Star Wars movie, including one, and there's no better way to describe him, Dancing Fool, who seemed to be very smitten with Brittany. 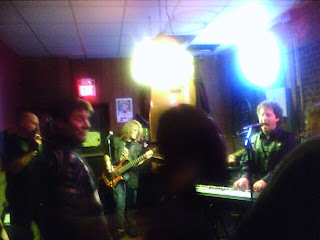 The band played amazingly well, despite the horrific acoustics of the sound system (more muddy than low tide at Harlem Yacht Club.) At one point, Jonathan donned his Gill sailing gloves, began a rousing rendition of "Sitting on the Dock of the Bay" and said into the microphone "I want to dedicate this to my crew." His crew? HIS crew!? When did that happen? OK -- Fine by me. I've got some bills to send you for YOUR boat, Jonathan. We only stayed for the first set and part of the second, but were very impressed with the keyboard and singing skills of Jonathan and his band. Dave, at one point, mentioned how amazing it would be if he ran the pit as well. Oh well, we can't have everything. All in all, a great night with great friends – long past overdue. We'll plan on more in the city or elsewhere.